What if your music collection looked as good as it sounds? Clean up your music library automatically. Email me in two days to see how I got on. Email me a once-a-month digest of articles from the blog. ... it makes your collection look better, saves a lot of manual retagging, and might even free up some of those evenings and afternoons for listening to the music, rather than fretting over it. For as long as I’ve been writing about audio gear – six years – I’ve been using bliss to automatically add cover art to each release in my music library. Even though it can be used for the smallest of libraries, it really pays for itself in terms of time saving features when used for monstrous music collections. The most impressive aspect of Bliss is the way it runs in the background and therefore keeps your music library in check based on the rules you set. As always, I recommend you take charge of your own library with Bliss. Accurate library management is important no matter what type of device you might use. bliss performs all the hard work in organizing your music collection; making it consistent, correct and complete with little effort. Imagine defining simple rules by which your music library is managed, and then having a sidekick use those rules to resolve inconsistencies, fill missing information and artwork, and correct wrong data. bliss applies these rules forever, aligning new music with your library, or implementing new rules across your collection as your music players change. bliss organizes your music files, so any music player, server or hi-fi system can benefit. 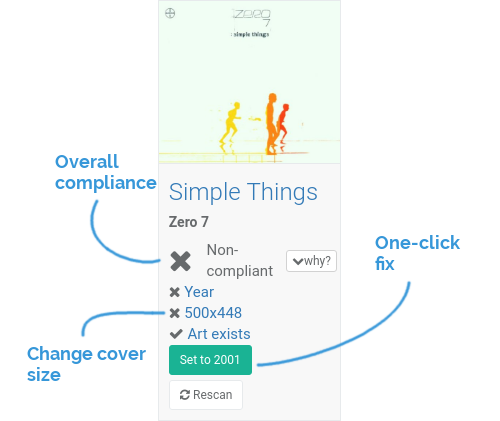 bliss is an album cover finder that is simple, fast and accurate. bliss finds and installs album art automatically, according to your rules. You can define minimum and maximum sizes, whether or not the artwork is embedded in the music files, and more options. bliss also finds alternative artwork which you can install with one click, ideal for those rare limited edition or re-mastered releases. 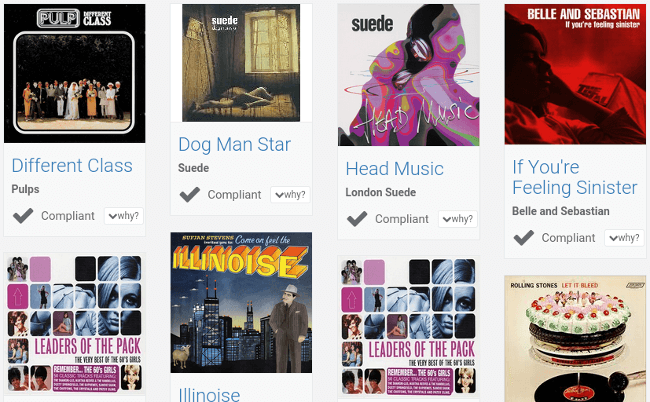 bliss uses both reputable and expansive sources for its album art, ensuring a vast majority of the artwork for your library is found automatically. bliss can organize your music files, renaming your files and folders. You can organize your music files and folders by specifying one file organization pattern. bliss then synchronises your tags with your file names according to the pattern, en masse and automatically if desired. Any metadata tagged inside your music files can be used in the file organization pattern, and you can also specify how you want to treat whitespace. bliss works by applying rules to your music library. When you add an album to your library, bliss automatically assesses the album against your rules. If the album is non-compliant, bliss decides a fix to make sure the album obeys the rule, and optionally applies it automatically. The rules that you can use to organize your library are extensive and cover everything from the sizing of your artwork to the capitalisation of track names or the granularity of genres permitted. You can even create your own rules! bliss can work fully automatically, listening to changes in your music files and re-applying the rules to the files that have been added or changed. 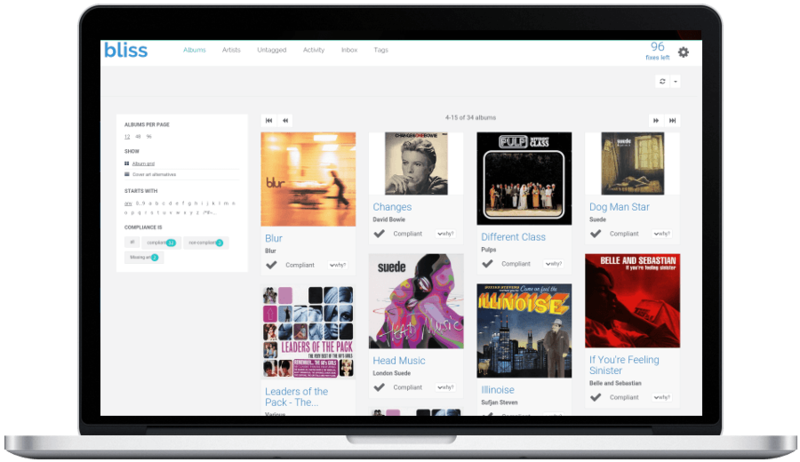 bliss has been built over seven years (and counting) by listening to what audiophiles and music lovers need when organizing and managing their music library. We started with album covers. Album covers (sometimes also called 'cover art') really improve your digital music experience. 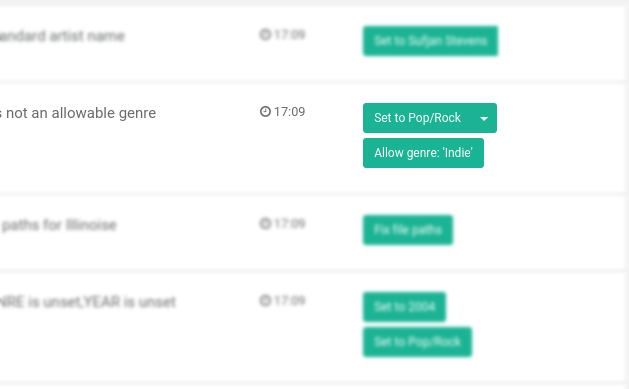 It makes it easier to navigate your music collection because it's easy to recognise albums. Plus album covers can be a great talking point when you show your music collection off to your friends! A common problem for many music lovers were album covers not displaying in their music collection. Commonly, the first reason might be that art is missing from your music library. If artwork is missing, you could go and find the covers yourself, then use a music tagger like MP3Tag to install it for you. But for 100s or 1000s of albums, that's a lot of work. bliss is an album cover finder that finds art online automatically, using reputable databases to ensure high quality matches. What if you know you have the covers, but it just isn't displaying in your music player? There are a number of possible reasons. Different music players have different rules. Some require artwork to be embedded within music files. Others only allow album covers which are of a desired resolution or data size. We then realised what worked for album covers can work for music library management in general. By making the rule the central point of control, rather than editing files directly, it becomes much more scalable to enforce consistency and completeness across your music library, however large it is. Coupled with robust ways of editing album covers or other metadata manually, this makes bliss a great all-round music organizer for large music libraries. 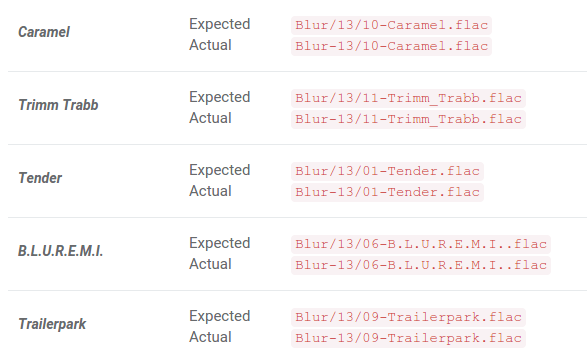 In addition, when music is added or updated, bliss assesses any new albums to make sure they have cover art, finding and installing any missing art, and letting you know if it cannot. bliss works in the background, unobtrusively watching your music collection. bliss has a Web based user interface, which means it is accessible from anywhere on your network, or even across the world.